> 1,000 pieces of equipment. > Over 55 years in business. We love it when people sport our apparel or attend events we help sponsor. So we’re inviting you to share your Instagram photos with the #CJMeverywhere. Your account must be public and have the #CJMeverywhere. Approved photos will appear on the photo stream below. Thank you for your support and have fun! 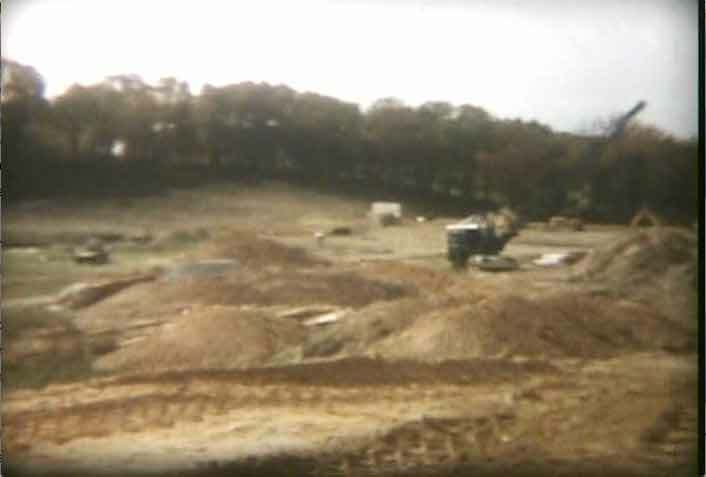 Clearing is often the first step for incomplete site development. Site clearing in central Maryland varies from mowing to brush hogging to the clearing of heavy stands of hardwood timber or pines. Our Site Clearing Crews are equipped with everything from massive stump grinders and tree shears to handheld chainsaws. We believe clearing a site quickly, correctly and safely is our first opportunity to impress a developer or property owner. C.J. Miller recognizes the impact clearing operations can have on the ecosystem, and our employees work hard to minimize waste and maximize reusable resources. Logs are salvaged whenever possible and hauled to local sawmills, pulp wood quality timber is transported to the pulp mill; and all remaining cleared debris is hauled to the tub grinder on-site to be turned into mulch. The mulch is then hauled to our storage yard for aging and processing to remove impurities and pests. The processed mulch is then sold to nurseries, landscapers and homeowners. 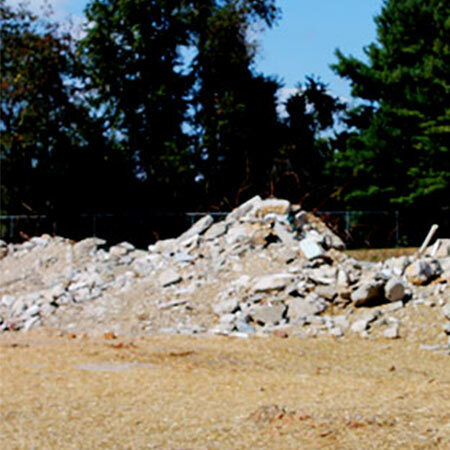 Often, sites which are not in need of clearing require demolition as the first major phase of site preparation. Unwanted buildings and foundations need to be removed before the site construction can begin. Additionally, curbs and paving are frequently part of the site demolition process. We have a wide range of heavy equipment to tackle almost any demolition job, including milling machines, stabilizers, pavement saws and hydrohammers. 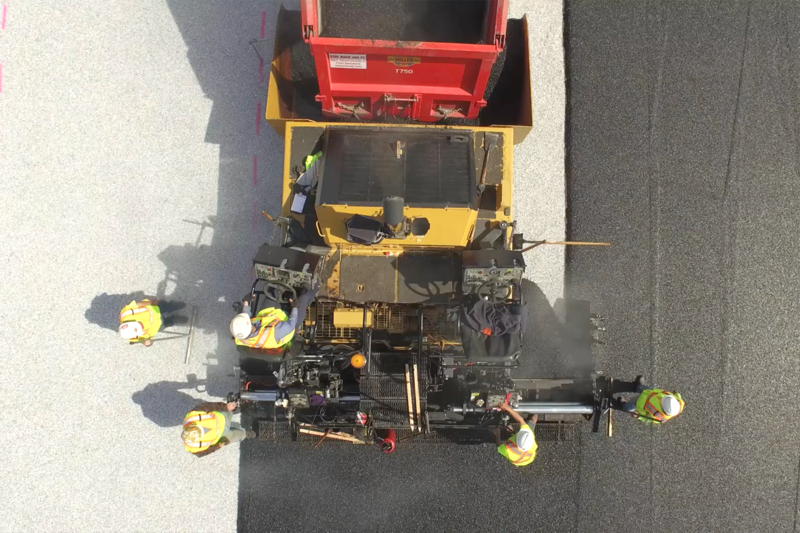 Whenever possible, we recycle existing pavement on-site as fill or sub-base material, producing very little waste and minimizing environmental impact. The right equipment combined with a highly skilled and experienced labor force allows C.J. Miller to demolish surface features swiftly and efficiently. Upon initial perusal of a site, surface items are obvious, but underground utilities are not easily seen. Pressurized water pipes, live sewer and storm drains, and gas or fiber optics lines each present their own unique challenge. Whether removing these utilities, connecting for future extensions or simply excavating in their vicinity, safety is our highest priority. Our safety department ensures all necessary safety procedures are implemented and verifies that each crew member is current on appropriate certifications and training. Mass grading for building construction is a major component of site preparation, and we are proud of the work we have done in this area. With a diverse fleet of excavation equipment, skilled and experienced operators and the ability to relocate it on a moment’s notice, we’ve developed superior capability to grade a landscape that matches your engineer’s design, on or often ahead of schedule. 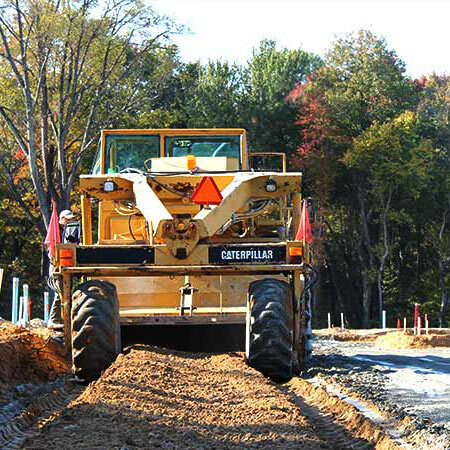 Over ninety percent of the equipment used on our job sites is company owned and maintained. C.J. Miller’s Equipment Division has the capacity to deploy on-site mechanics, which minimizes down time and ensures work continues on schedule. For improved accuracy and savings generated by accelerated schedules, we install Global Positioning Systems (GPS) technology on our excavating equipment. We use Topcon and Trimble to take advantage of all the benefits they offer. With the ability to set grade stakes on the spot and quickly and accurately check work in the field, our crews avoid mistakes that can cost money and delay project completion. This GPS technology has enabled us to reduce costs and remain competitive without reducing the quality of our work. As a result, C.J. Miller prides itself in a high rate of repeat business. Loyal clients are the best evidence of our commitment to excellence. Utility installation work can be dangerous because it occurs in trenches up to twenty-five feet or more below the surrounding surface. We provide the most effective safety equipment available to all utility crews, and strictly enforce and monitor the equipment’s use and maintenance. The combination of safety minded, highly skilled, properly equipped crews, combined with quality materials, ensures that utilities are properly installed the first time, every time. The Chesapeake Bay watershed is a cherished resource that stretches north to Cooperstown, New York and includes much of Pennsylvania, Maryland, Virginia, West Virginia and Delaware. Stormwater carries pollutants into the bay from farmland and developed areas within the watershed. Every effort needs to be made to ensure pollutants are removed from storm water runoff. C.J. Miller routinely constructs stormwater management ponds and cutting edge filtration systems which remove pollutants and sediment before the cleansed water is released back into the drainage system. Fine grading is the customization of a site once mass grading is completed. Our state-of-the-art equipment is operated by experienced, highly skilled personnel. We accurately and efficiently grade road shoulders, slopes, storm water ponds and landscape design areas to exact specifications. 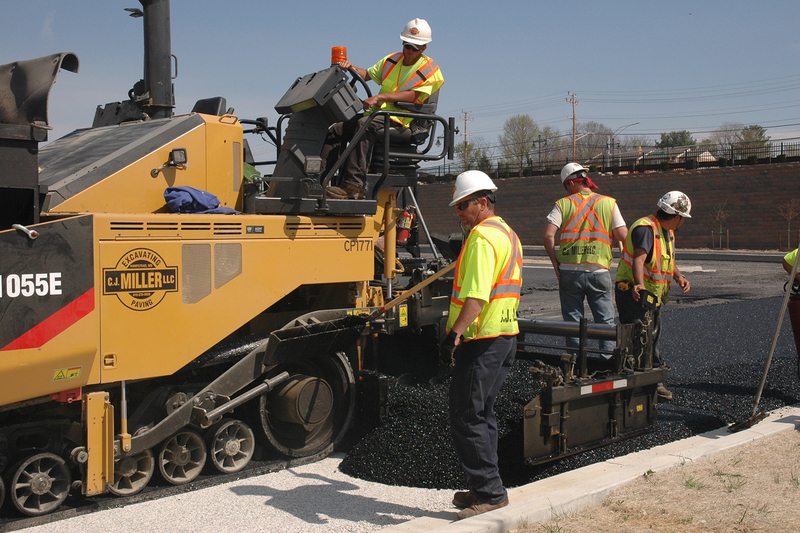 Fine grading is also the last step before pavement and curbs are installed, and requires a high degree of accuracy. Attention to detail in applying the finishing touch to a project is just another reason C.J. 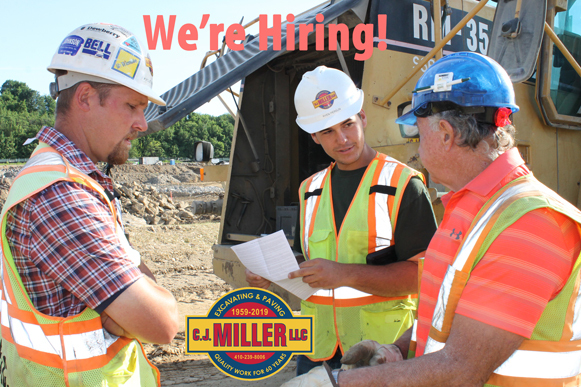 Miller has earned a reputation for producing high quality construction results throughout the region. Bituminous curbs and concrete curbs are commonly included in the design of projects in our region. Essential for runoff management, curbs are permanent, highly visible and provide customers with their first look at a finished product. C.J. Miller Curb Crews ensure quality workmanship from standard installations to the most unique patterns found in today’s latest designs. Top quality is achieved through the proper maintenance of equipment, the purchase of quality materials, and most importantly the utilization of experienced, highly skilled personnel. Paved roads are the transportation arteries for an area dependent on the commuting workforce. At C.J. Miller, we take great pride in our reputation for high quality installations. Frequently exceeding customer specifications for quality, our installations for municipal, county, and state projects are utilized by millions of people annually. We start with experienced, highly skilled employees that share in our commitment to excellence. 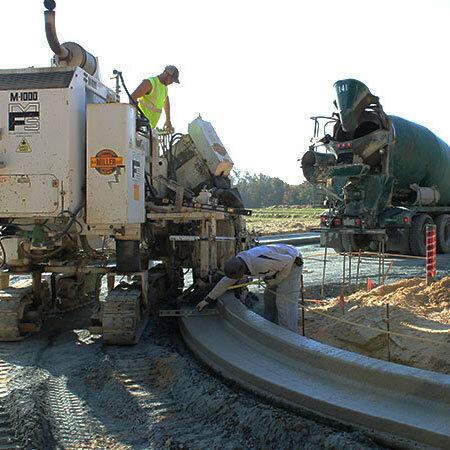 We equip these crews with the latest methods and technology for asphalt installation. Lastly, we utilize the highest quality materials available, resulting in a finished product that both CJM and the customer can be proud of. 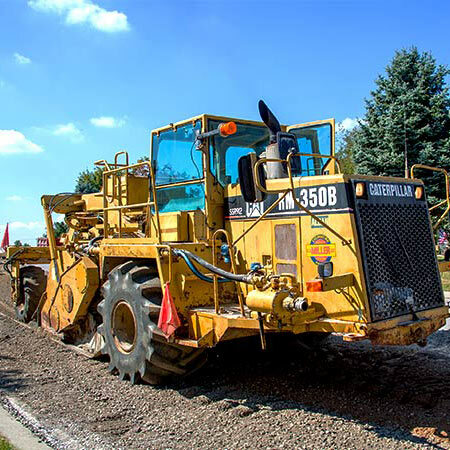 The process of rehabilitating existing paved structures is known as reclamation, where existing pavement and paving subgrade are pulverized and blended with chemical additives to create a more stable, homogenous base. The reclaimed pavement is then resurfaced using new material for a high quality product. This process replaces the old method of pavement destruction, which consists of removal and replacement with new materials. The new reclamation method reduces labor, equipment, and fuel resources, but most importantly, conserves natural resources by recycling the existing pavement. The geologic make-up of the region requires us to work in many locations with soils that are not suitable to support roads or structures. The Soil Modification Division services the demands of customers that are developing sites with unsuitable soils. Soil modification requires alteration of the structure and texture of the natural soil to make it stable and suitable as fill material. The process requires adding Portland Cement to the subgrade in amounts and depths determined by the Soils Engineer. C.J. Miller Crews then go to work utilizing specialized equipment to transition the unsuitable site into one that is structurally sound. Throughout the winter season, C.J. Miller offers commercial snow removal services. Our snow removal team works to remove snow from retail and school parking lots, work sites, and roadways. 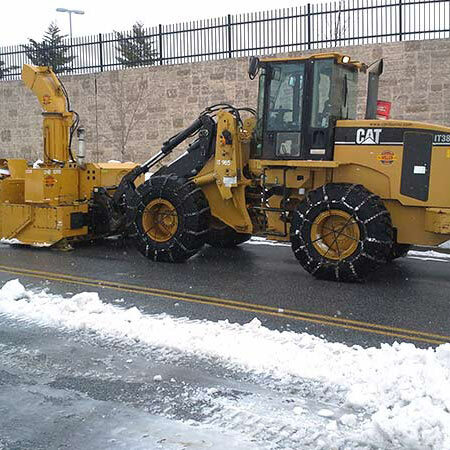 Our top-grade snow removal equipment includes multiple pieces for large jobs. Clearing is often the first step for in complete site development. 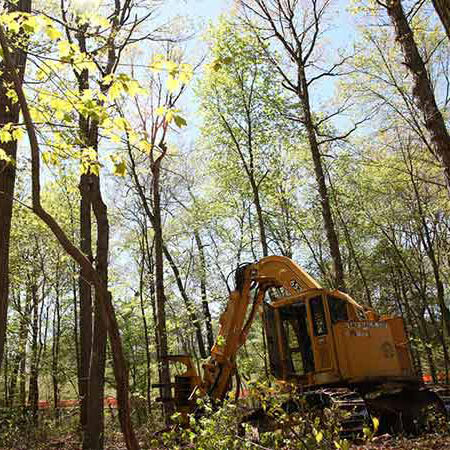 Site clearing in central Maryland varies from mowing to brush hogging to the clearing of heavy stands of hardwood timber or pines. Unwanted buildings and foundations need to be removed before the site construction can begin. 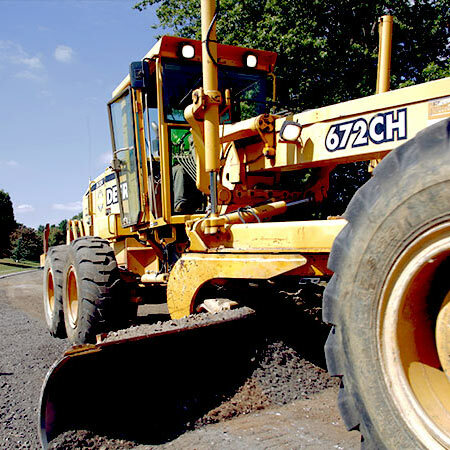 Additionally, curbs and paving are frequently part of the site demolition process. We have a wide range of heavy equipment to tackle almost any demolition job, including milling machines, stabilizers, pavement saws and hydro-hammers. 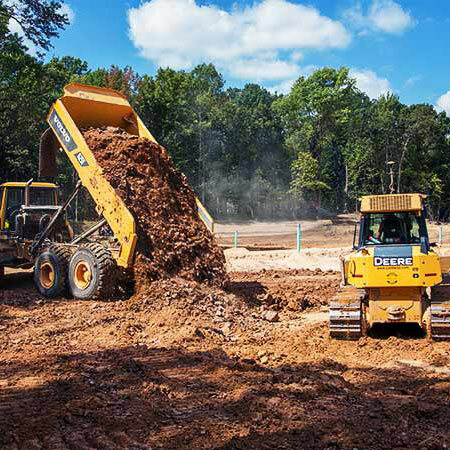 Mass grading for building construction is a major component of site preparation, and one that we take great pride in. 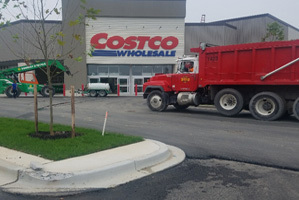 With a diverse fleet of excavation equipment, skilled and experienced Operators and the ability to relocate it on a moment’s notice, we’ve developed superior capability to grade a landscape to your engineer’s design, on or often ahead of schedule. C.J. Miller utilizes its own utility crews and on occasion sub-contractor crews to meet the utility needs of its customers.Utility installation work can be dangerous. The installation of utilities occurs in trenches that can be twenty-five feet or more below the surrounding surface. The company provides the best safety equipment available to all utility crews, then strictly enforces and monitors this equipment’s use and maintenance. The combination of safe, well trained, well equipped crews with the purchase of quality materials ensures that utilities are properly installed the first time, every time. Fine grading is the customization of a site once mass grading is complete. 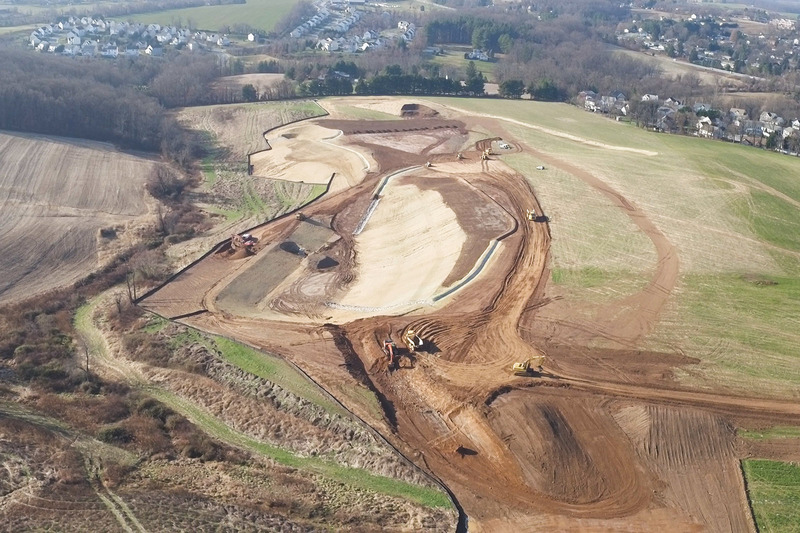 Our state-of-the-art equipment operated by experienced, highly-skilled personnel can accurately and efficiently grade road shoulders, slopes, storm water ponds and landscape design areas to exact specifications. Bituminous curbs and concrete curbs are commonly included in the design of projects in within our region. Essential for runoff management, curbs are permanent, highly visible and provide the customer with their first look at a finished product. Paved roads are the transportation arteries for an area dependent on the commuting workforce. At C.J. Miller, we take great pride in our reputation for high quality installations. Frequently exceeding customer specifications for quality, our installations for municipal, county and state projects are utilized by millions of people annually. 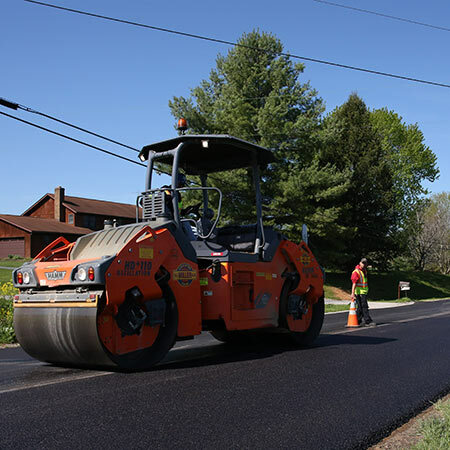 The process of rehabilitating existing paved structures is known as reclamation, where existing pavement and paving sub-grade are pulverized and blended with chemical additives to create a more stable, homogenous base. The reclaimed pavement is then resurfaced using new material for a high quality product. The geologic make-up of the region requires us to do work in many locations with soils that are not suitable to support roads or structures. The Soil Modification Division services the demands of customers that are developing sites with unsuitable soils. 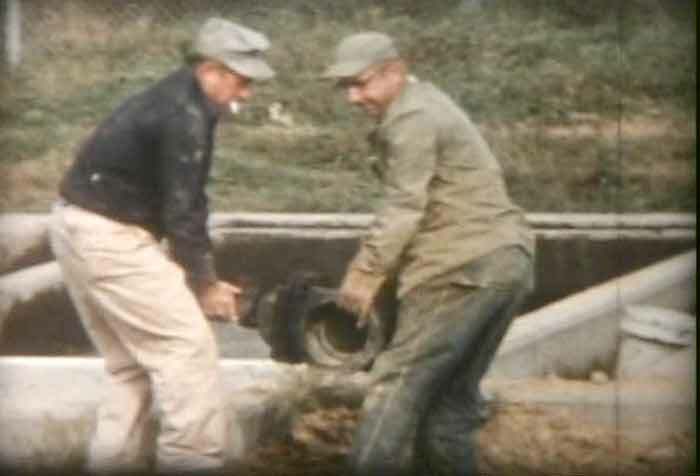 In 1957, Charles J. Miller, Jr. (Buck) purchased a backhoe and started installing septic and sewage systems while still attending high school. With a single full-time employee, one part-time employee and a dump truck; Buck and his crew completed roughly 150 installations per year. In 1959, Charles J. Miller, Inc officially opened for business, primarily completing farm ponds and soil conservation projects. By this time a dozer, loader, tractor and lowboy were added to the equipment fleet. Over the next few years, CJM continued to add employees and moved into larger excavation projects like commercial foundations. In 1964, Elwood Utz became the first CJM Foreman (other than Buck) which commenced an era of multiple crews contributing to daily production. In 1970, the decision was made to build a hot mix asphalt (HMA) production facility in Legore (Woodsboro), Maryland, and Miller Asphalt Products, Inc was born. At the time, many of the municipal and county roads in the area were surfaced using the “tar and chip” method. In 1971, CJM began installation of hot-mix asphalt, mostly on driveways and farm lanes. During this period, Buck made an effort to educate local government officials on the superiority of roads surfaced with HMA compared to tar and chip. In 1979, a second HMA plant was built in Finksburg, MD. It was during this period that CJM began paving larger state and county roads. In 1984, the Finksburg location expanded to two HMA plants in order to more efficiently satisfy customer demand while continuing to provide material to the growing construction business. 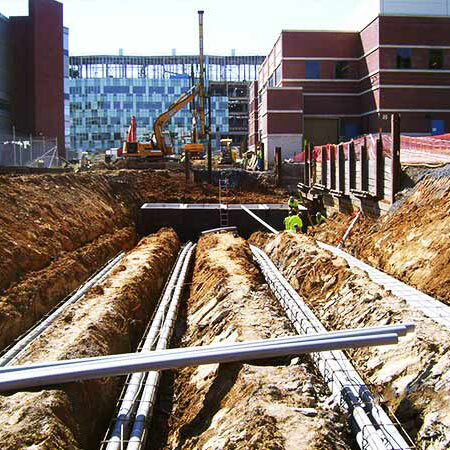 In 1988, CJM began working on underground utility projects, focusing on water mains, sewer mains and stormwater management systems for residential, municipal and commercial customers. In 1994, pursuant to the goal of becoming a full service site development contractor, the formless curb division began pouring installations on CJM site preparation jobs. In 1995, land clearing commenced, coupled with mulch production. Additionally, the Legore (Woodsboro) Plant was moved across Route 194 from its original location within the Legore Quarry (now Barrick). In 1999, a third HMA production site was purchased in Westminster, Maryland. A fourth HMA plant was constructed on the site to satisfy increasing demand. In 2004, Charles J. Miller, Inc and Miller Asphalt Products, Inc. were restructured into C.J. Miller LLC. Buck’s children, Lisa, C.J. and William joined their father in ownership of the newly reorganized company. CJM commenced land clearing operations for customers and began manufacturing mulch to serve retailers, landscaping service providers and homeowners. In 2011, Buck passed away at the age of 71. He is fondly remembered as “a reliable partner that got the job done right” by his business associates, “a tough-love boss with a big heart” by his many employees, “extremely generous with his time and resources” by his community and a loving husband father and grandfather by his family. In 2013, C.J. Miller LLC is the premier, full service site development contractor within our markets. Lisa, C.J., and Billy still manage CJM daily operations with the same determination, work ethic, and integrity as their father did when he led the company for over 50 years.